Have you ever wondered what actually goes on at instantprint to make the print magic happen? From how our website looks, to our email design and even our handy design guides, there’s loads of work going on behind the scenes in our Creative Team. Heading up the Creative Team is instantprint’s Creative Lead, Jennie. 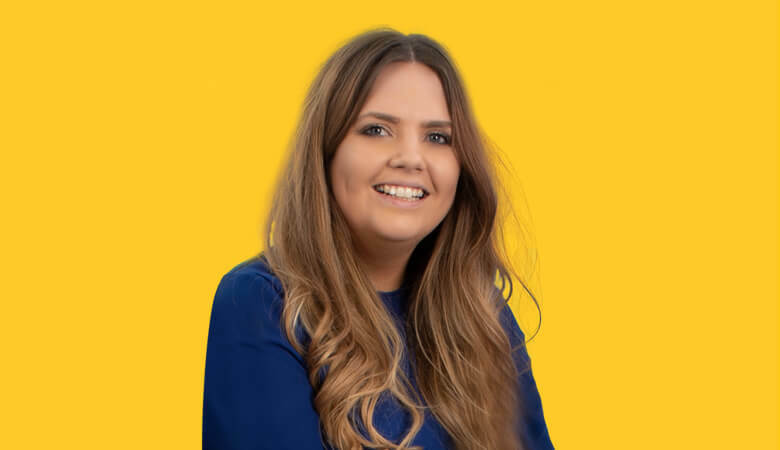 Here we talk to Jennie to find out all about her favourite creative projects, what a standard day in the office looks like for her and how her role impacts your print-buying journey. I head up our Creative Team which includes Ryan our Graphic Designer, Jessica our Content Executive and Kirsty our Online Template Designer. My role involves leading on creative projects. This could be anything from designing product guides to helping customers with specific products, or even to designing a campaign about the world’s biggest Business Card (which, yes, we hold the world record on!) I also have to make sure that any visuals sent out through our website, email, social media, etc. are consistent with our brand. My role is quite varied in that the projects I work on could range from the first time a customer finds out about instantprint all the way to aftercare. It’s important that the first time a customer sees an advert for instantprint, they’re inspired and want to learn more. I make sure that, at every point in a customers’ print journey, all the information, imagery and graphics we use make things clear and easy to understand. The question I always ask myself when I’m designing is: would my mum be able to understand this? If she wouldn’t, then it’s back to the drawing board! Print is a tricky thing to order, especially when you’ve never done it before, which is why we always put the customer in the forefront of our mind when designing. I’m proud of everyone who works at instantprint. It’s so lovely to be in an environment where everyone gets on and you’re never afraid to ask anyone for a favour or help. I also love that, whether it’s through our Customer Service Team or through the usability of our website, instantprint is all about helping the customers – our main aim is making print accessible to everyone. What’s your favourite creative project that you’ve worked on so far? How do you come up with an idea for a creative project? Ooh good question! I actually get asked this quite a lot. The process of designing is different for every project. For bigger projects, we usually have a creative ideation session where the Marketing and Creative Teams join together to think of ideas. I love these sessions as we all bounce off each other and usually end up coming away with an idea we’re all excited about. Let’s start with the random fact (since it’s become such a big talking point in the office). I write upside down. As I’m left handed, I can’t write with the paper the normal way up, meaning that it’s fully upside down. My hobbies include skiing and scouring Pinterest as I recently got engaged. This also means that wedding planning is definitely taking up a lot of my spare time. I can’t wait to design and print my own wedding stationery! Depending on what projects we have on, my day can vary. First of all, I have a quick check in with the team and then I get cracking with my to-do list that I set at the start of the week. We work week to week in the Creative Team, so on a Friday I meet with the rest of the Marketing Team and Tamarind, our Web Project Manager, to discuss what projects we can fit in. These can range from the weekly email to creating an infographic using results from a survey. My day is spent looking for inspiration for email headers, product images or designing banners for our website.